The global day of action to reach gender parity by 2025 had events in 217 cities in 26 countries. Oh no, did you miss it? You can watch the livestreams. Sold out crowds joined in for a nationwide shift from "power over"something to "power to" accomplish the personal action plan and more. And they can bring their training to your company or community. A stellar program for "Women, Power and The Art of Leadership Parity" used music, performance, spoken word and interactive discussion to explore the mission of gender parity starring Kathleen Turner, Alysia Reiner, BETTY, Brooke Axtell, and so many more. Gloria's "The Sum" Weekly Column: Word of The Week Is Powertopia. As in a world where power and leadership are shared equally by men and women. To be successful, women have to embrace the power in our hands and go full out for full power sharing. Find more detailed information about Take The Lead Day and next steps here. Because enough with the talk—the day was all about action. 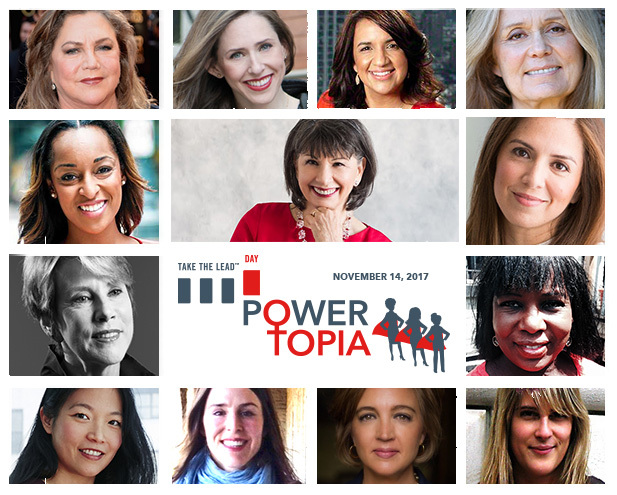 Follow up Powertopia with your own Personal Action Plan and commitment to gender parity with any or all of the Take The Lead resources here. Learn more about Take The Lead Day's "Leadership in Action" initiative with Gloria Feldt, co-founder and president of Take The Lead; Gloria Steinem, author and activist; Sarah Jones, actress and Reshma Gopaldas of SheKnows Media. In the wake of the harassment deluge, what does the future hold for gender justice? We love the look of this new Barbie modeled after the Olympic fencer. Get up to date on the latest research quantifying women's rise in leadership. Check out the challenges for women in tech start-ups facing male investors. Idaho shows double the number of women in business. Take the lead from Wonder Woman who uses empathy as a strength. "Finding clarity on what your purpose is — there's a ripple effect to that. Staying focused on your personal mission and your personal movement in this bigger movement is the best thing we can do." INVEST IN YOURSELF—REGISTER for the NEW Power To Lead: 9 Power Tools online self-study course here. BRING TRAININGS from Take The Lead to your company or community — learn how here. DOWNLOAD the 2017 Powertopia Symposium agenda here. DOWNLOAD the 2017 "Women, Power and The Art of Leadership Parity" agenda here. Lyft is driving all of us to gender parity with donations to Take The Lead as a sponsor of Take The Lead. New users can sign up with Lyft, get the app and use the code TAKETHELEAD to get $5 off up to 4 rides, and $10 goes to Take The Lead. Current Lyft users can use the code TAKETHELEAD17. Celebrate women's leadership equality with our limited edition, ‘Take The Lead,’ women's white t-shirt. This design is ethically produced in the U.S.A. and has a soft, buttery feel. We believe ‘wearing your truth’ creates such a culture! Each piece is a conversation starter and statement maker. 100% of the proceeds from this sale will be donated back to Take The Lead. Help us spread Love Over H8! If you like what you see, if you found value in Take The Lead Day and if want to support Take The Lead’s mission of gender parity by 2025, please text TAKETHELEAD (no spaces) to 41444 to ensure more women gain access to leadership training programs and free resources like our breakthrough training, Virtual Happy Hour role model programs, and this newsletter.